Complete the form to the right to send your friend a digital $50 Beautique Gift Card they can use towards their first service purchase of $125 or more. Complete the form below to send your friend a digital $50 Beautique Gift Card they can use towards their first service purchase of $125 or more. Your friend comes into Beautique and completes their first appointment at Beautique. We’ll mail you a $25 Beautique Gift Card, valid on any purchase. No minimum purchase, use on services or retail. Our referral program is uncapped! 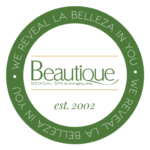 You will continue to earn a $25 BeautiRewards for each valid referral you make who becomes a Beautique Client. We will email you when your credit is added to your account so you can use it on future purchases. But remember, your credit expires six months from issue date. All of our skincare and makeup products.